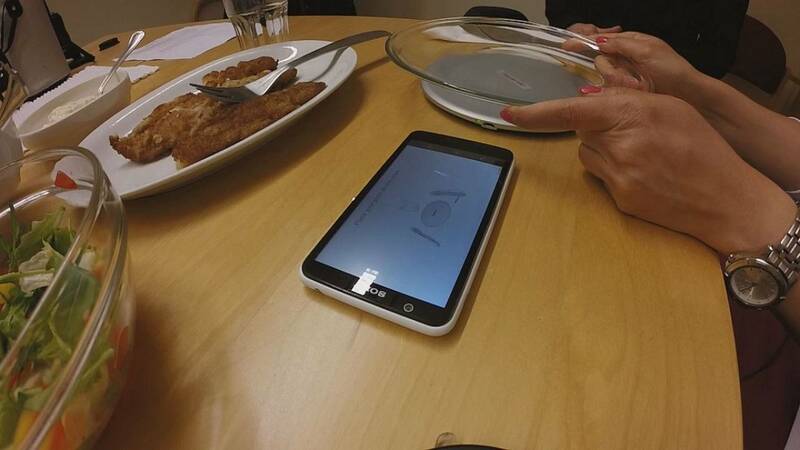 For the past two years students at a school in Sweden have been weighing out their lunches on devices called Mandometers. It is all part of an innovative new project designed to prevent people becoming obese or developing an eating disorder. The target group exists and they are in danger of becoming obese. It is a very large part of the population. The Splendid Project is all about finding a technological solution to stop people eating too much or too little, before it becomes too late. Students at the Internationella Engelska Gymnasiet in Stockholm have taken part in the latest phase of the EU project, testing a Mandometer scale, smartphone app and an activity sensor. With seven partners in five countries, the project makes use of the Mandometer, a scale developed back in 1993. It teaches people to eat properly again by showing what they should put on their plates, how fast they should eat it, when they should stop and when they should feel full. The long-term vision is to commercialise the Splendid platforms, as the project coordinator explains. “We try to improve it as much as we can and to plan our next steps so it can be used on a very big scale, precisely because we see that the target group exists and they are in danger of becoming obese. It is a very large part of the population,” says Professor Anastasios Delopoulos. The prevalence of obesity doubled between 1980 and 2014, (WHO worldwide figures), and it is considered one of the great public health challenges. For everyone involved in Splendid, prevention is key. “The alternative is drugs, it is for the obese surgery, very lengthy treatment. So if we can prevent eating disorders and obesity that would be the goal of our work,” says founder and CEO of Mandometer Clinics Dr. Cecilia Bergh. Worldwide some 2 billion people are now overweight or obese. Pierre Vial has lost 43 kilos over the past nine and a half months. He and other patients at the eating disorder clinic explain the effects obesity and anorexia have had on their lives. “When you put on weight you just literally hate yourself, so you don’t look at yourself in the mirror any more. When you buy clothes you just get something, and you can’t really stand yourself any more,” admits Pierre. Vanessa White – who will soon head home to Australia after successfully completing her treatment, says anorexia ruled her life, and that of her family, for years: “I didn’t really have any life, I mean I was at school but I would come out for morning tea and lunch to eat with my parents and I lost a lot of friends,” she says. Another patient, Karin Borell, still has some months to go at the clinic but, after decades of battling anorexia, is beginning to be able to visualise life without the illness: “On a good day I see myself living a normal life without an eating disorder, without problems with food. That’s really all I wish right now,” she says.